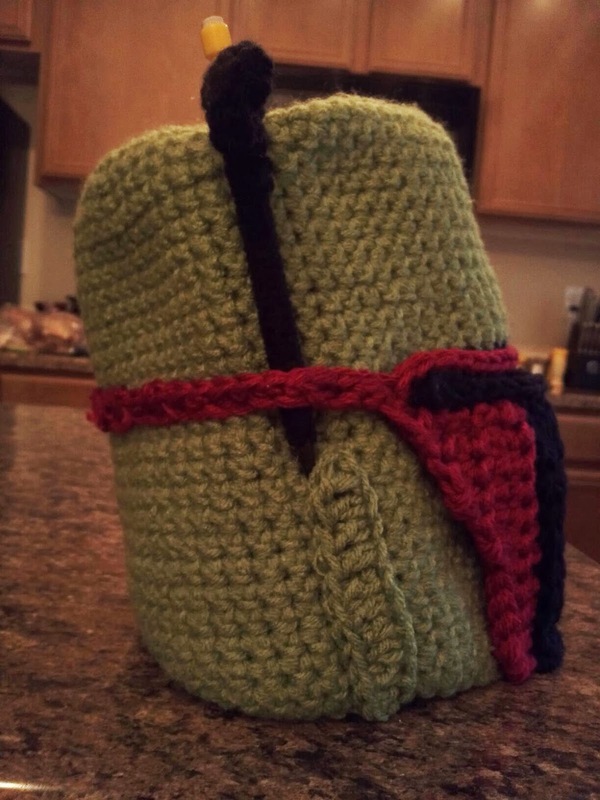 A fun crochet and knit blog. I am a big nerd who loves Star Wars. I fondly remember days spent at home eating my dad's delicious chili and curled up on the couch having Star Wars marathons. This was back in the day when it was the original, unenhanced, VCR (maybe even copied off of TV) version. I now own all the epic movies on DVD, but still enjoy the old ones the best. 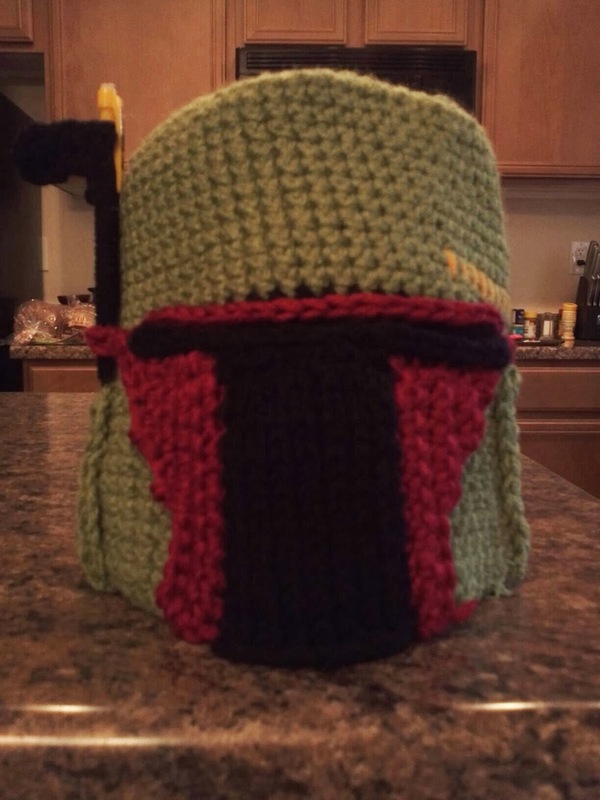 There are lots of star wars hats, amigurumi action figures, death stars... 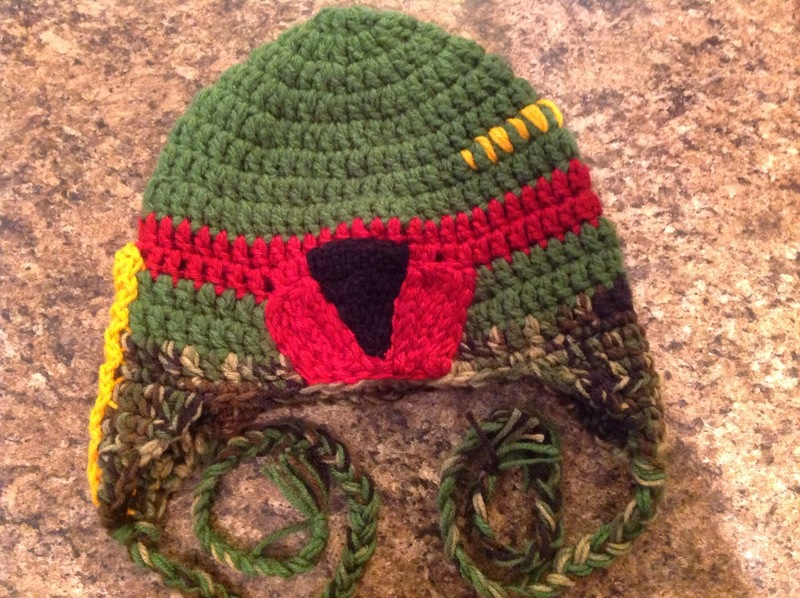 I am a fan of making Boba Fett hats. I have made four and they are all different. My first attempt was a ski mask. I had to restart this one a few times to get the size just right. The first one I made looked like it could fit a sumo wrestler! I even had a pencil wrapped up in yarn for the antenna. I was really happy with the way this one turned out. Although it does look boxy in pictures it fit very perfectly. 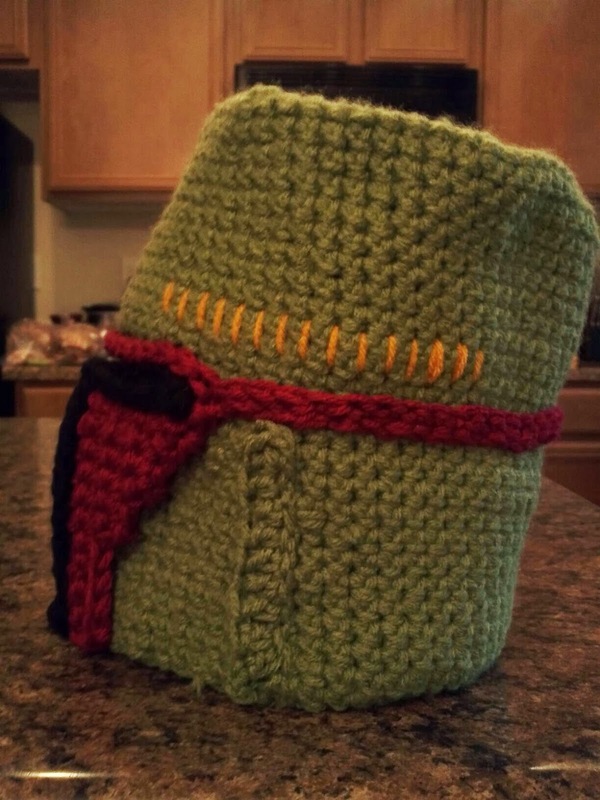 My next one was created just this past christmas for my nephew. I saw other nifty star wars lovers had added this patch on the back, and I liked it, so I did it too! 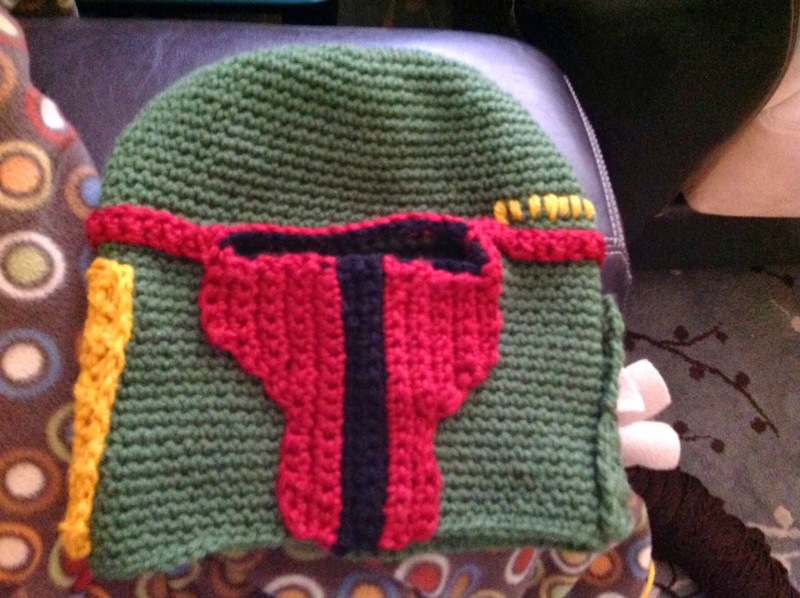 Next, I had a friend request more of a hat like version. Instead of doing all appliques, I did some surface crochet for the front mask and weaving. I think this one has turned out very nicely and I have kept track of the pattern, to share with you. Change color to red yarn. Round 13: SC around, join. Fasten off. Place ear flaps 7 stitches from back seam on each side, leaving 16 stitches open in the front. Row 4: HDC 2 together, 2 HDC, HDC 2 together, fasten off. The ear flaps can be done in DC and made to be longer by decreasing on the sides on every other row. There are many ways to achieve the ear flap look, whatever works for you is what you should do. Cut 6 1 yard strands of various colors. The more strands you have, the thicker the braid, so feel free to add more. Fold in half and tie with a slip knot to bottom of earflap. Braid the strands together to desired length, tie, and trim. Repeat on the other ear flap. The mask on this one is a combination of surface crochet, weaving, and appliques.The surface crochet is free hand, but if you would like to use the appliques just make them using the same hook. Every odd row is the right side and every even row is the wrong side. When finished with the black on the odd rows (right side facing you) hold the black yarn in front. When you are finished with the black on the even rows (wrong side facing you) hold the yarn in the back. When you are not working with the red it always should be held on the wrong side. Only one side should look like a jumbled mess. When changing colors you can use a slip stitch, just make sure you don't count the slip stitch when you crochet across the next row. Row 11: SC across, fasten off. 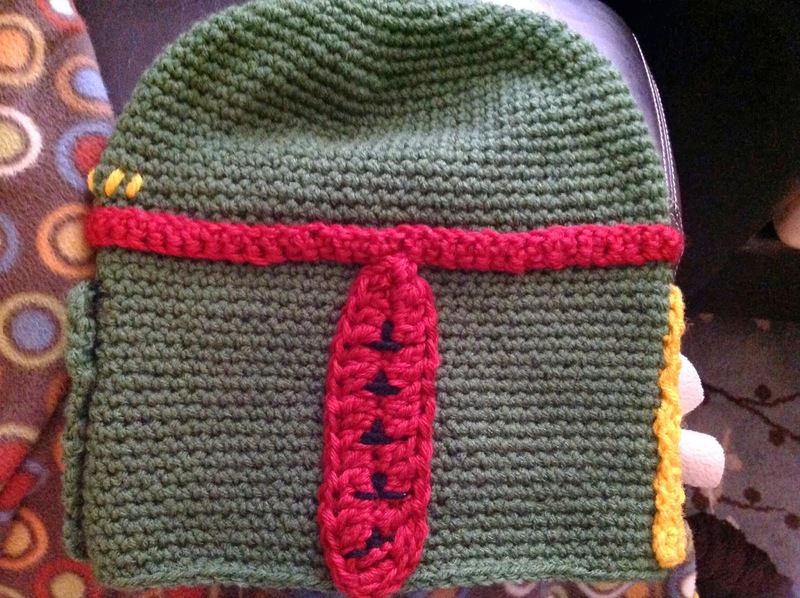 Sew onto hat in center space. Chain 18, 15 DC starting in second chain from hook, 3DC in last stitch, 15 DC down the other side, join in first DC Fasten off leaving a long tail to sew onto hat. 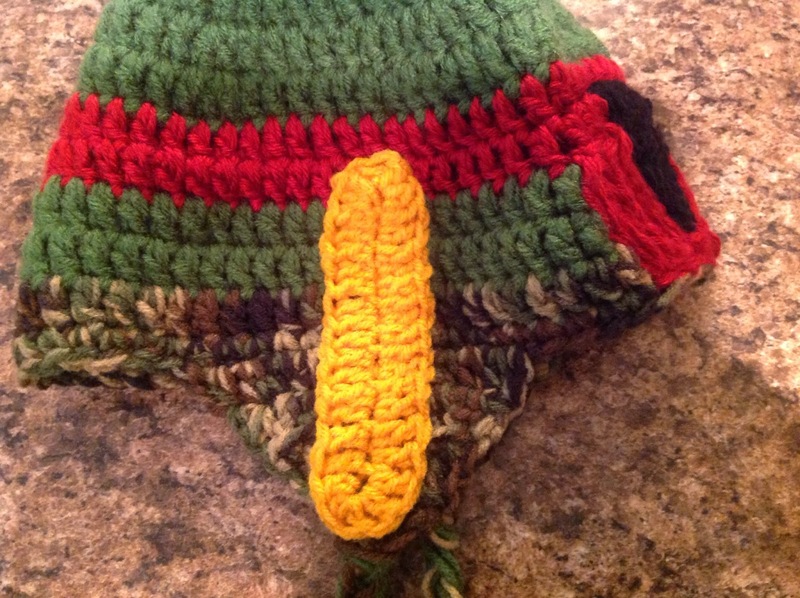 Also use the yellow and a tapestry needle to whip stitch the yellow bars that go two rows above the red stripes on the hat and on the opposite side of the vertical yellow bar. I do around 5/6 stripes. Weave in all the ends and you're done!